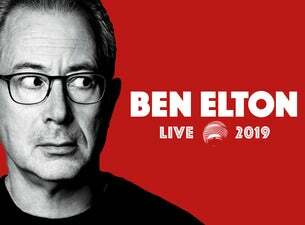 Stand-up comedian Ben Elton will be touring for the first time in 15 years in 2019. He exploded onto the British comedy scene as the host of the hugely successful Channel 4 show Saturday Live. The weekly live show ran from 1985-88 and featured performances and sketches from an array of Britain’s best loved comedians. Alongside his stand-up career, Elton has had huge success as an author, playwright, actor and director. He's written for television shows such as The Young Ones, Blackadder 2, Blackadder The Third, Blackadder Goes Forth, The Thin Blue Line, Mr Bean and more, as well a writing two feature films: 2000’s Maybe Baby and 2017’s Three Summers. A highly respected author, Elton has published 15 novels, six of which were UK No.1 bestsellers. He's also widely known for his writing for the stage, and in particular, his work on the smash hit We Will Rock You based on the music of British rock legends Queen. A serial award winner, he has won three BAFTAs, two Laurence Olivier Awards and The Royal Television Society Writer’s Award. Elton’s new tour promises to be a belly laughter-filled night, as he tries to make sense of the current state of the world. Find tickets across a variety of cities and dates next autumn from 30 September – 30 November 2019.